Overlooking the deep blue waters of the Persian Gulf, Dubai is a city where past, present, and future collide. Ultramodern, glass-and-steel towers stand alongside historic Arabic Malqaf (or windcatcher) buildings. Dubai denizens pull up to traditional souks in Italian supercars. Executives at multinational corporations relax at desert getaways, with nothing more than the night sky, a good meal, and maybe a camel ride. But Dubai is more than just a dynamic metropolis. It’s also a key hub for Emirates flights. Because it’s an easy stopover, it’s perfect for a refreshing appetiser to a longer journey or a final taste of adventure before heading home. Whatever your reason for a stopover, Dubai has plenty to offer seasoned travellers and wide-eyed newcomers alike. Jet lag is the bane of international travel. You know what it’s like to arrive drained at your destination; your internal body clocks takes far too long to reset. As a result, Dubai is a great stopover for travellers who want to adapt to changing time zones. Cost matters, too. Because Dubai is the hub for Emirates flights to global destinations, it’s inexpensive and easy to find an outbound flight for your next stop. With other airlines, you’ll get hefty premiums for multi-day layovers at interim destinations. Let’s take a look at what Dubai has to offer. Dubai was first settled in the nineteenth century. A bustling port, it was best-known for pearl divers and delectable seafood. After the discovery of oil, however, Dubai grew exponentially. It re-invested its oil revenues into building the world-class infrastructure and free trade zone that it is today. But even on the pulsing, futuristic streets of today’s Dubai, you can still see glimpses of a slower, more traditional lifestyle. If you’re looking to peek into the past, look no further than the Al Fahidi Historical District. Duck into traditional Bedouin compounds, once home to merchants and fishermen. Now, they’re the site of trendy art galleries, tasty cafes, and even the occasional souk, or traditional market. Haggle over pearls, textiles, and spices—Dubai’s three, traditional products. And don’t forget to smile. If you’re a history buff, you’ll enjoy the Dubai Museum, housed inside a mighty fort that once guarded the approaches to the city. Here, history comes to life: explore past models and dioramas of monuments, weapons, ships, and drawings, or stop at recreations of vibrant, bygone markets. For the culturally-minded visitors, consider experiencing the Sheikh Mohammed Centre for Cultural Understanding. Within the stunning compound (formally a traditional wind tower), you can sample traditional Emirati cuisine, take guided tours of A Fahidi, and experience Emirati culture first-hand, from falconry to embroidery. Dubai prides itself on having something for everyone. Shoppers, foodies, photographers, and adventurers often find themselves overwhelmed with the number of options. There seems to be an endless stream of awe-inspiring landmarks, buildings, eateries, and other, previously inconceivable attractions. One of the best-known attractions is the Palm Islands, the largest manmade archipelago in the world (and an astonishing feat of engineering). Built with reclaimed sand dredged from the ocean floor, the islands comprise Palm Jumeirah, The World Islands, Deira Island and Palm Jebel Ali. In total, the Palm has 520 kilometres of beaches, lodging, restaurants, and shops—all steps away from the warm, azure waters of the Persian Gulf. If you’re a shopper (and even if you’re not), you have to see the spectacle that is the Dubai Mall. Over 1.2 million square meters of consumerist heaven, the Mall includes 1,200 shops and saw 80 million visitors in 2014. Shoppers and day trippers can browse high-end retailers, dine at world class restaurants, and visit the stunning, otherworldly Dubai Aquarium and Underwater Zoo—or skate at the Dubai Ice Rink. Hop into Platinum Heritage’s authentic, restored Land Rovers from the 1950s and drive off into the desert conservation reserve. 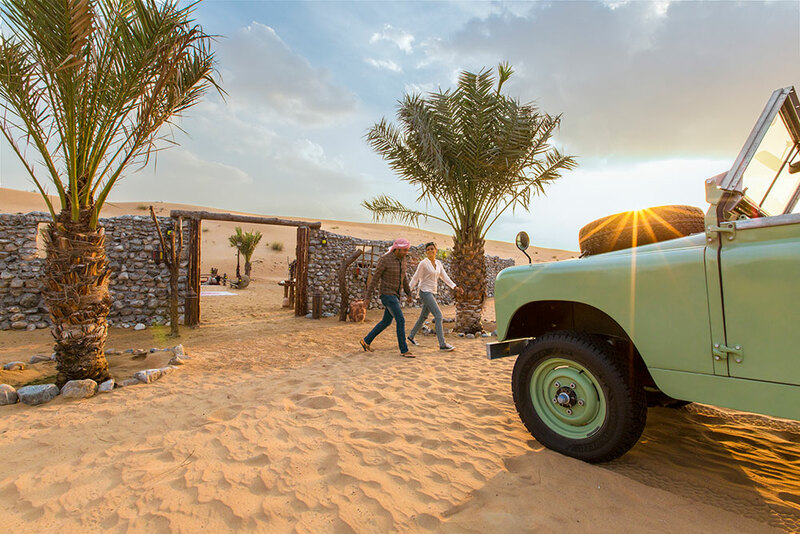 At your camp, you can choose from a number of experiences: ride on hardy camels, watch a falcon demonstration, and enjoy the performances of traditional Emirati dances. Afterwards, sit down to an authentic meal prepared on-site, sip traditional Arabic coffee, smoke aromatic shisha, and chat with new friends and loved ones under the vast desert sky. Be it ultramodern metropolis or Bedouin tradition, Dubai has it all. If you’re thinking of stopping over in Dubai, take a look at our full Dubai Stopover Guide.